The Macon County Public Library, a member of the Fontana Regional Library, and the Friends of the Library are pleased to be installing another Little Free Library at the Parker Meadows Complex. Located off Highway 64 west of Franklin, this 40+ acre sports complex offers an assortment of outdoor recreational activities. With a majestic view of the Nantahala Mountains, the refreshing waters of the Cartoogechaye Creek, walking paths and other outdoor activities, the Parker Meadow Complex is a great setting for the newest Little Free Library. 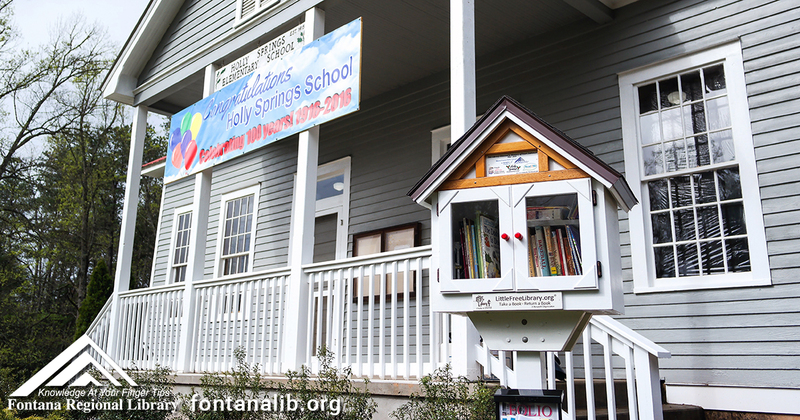 The Friends of the Library have been instrumental in placing Little Free Libraries at the Franklin Town Hall, the Iotla Methodist Church, the Holly Springs Community Building, the Otto Community Development Organization, the Mulberry Methodist Church, and the Macon County Crawford Senior Center. These libraries are conveniently located in great places for people of all ages to find good things to read. If you’re not familiar with Little Free Libraries, check out their website at www.littlefreelibrary.org. We’d love to have you join us to celebrate the installation of the Little Free Library at the Parker Meadows Complex on 4199 Patton Road west of Franklin on Thursday, May 24th at 10:00am (weather permitting). If you can’t make it, no problem – the Little Free Library will be there for you on your next visit to the Parker Meadows Complex!